This change in consumer attitudes — visible not only in the U.S. but also in other countries affected by the Great Recession — is not a fad or whim. It is, in part, a reaction to economic hard times. But it is also closely related to the civic dissatisfaction that is rocking the political establishment, and additionally has some roots in environmental awareness and changing aspirations. That is why this Spend Shift movement, as we call it, is here to stay. It will create opportunities for businesses that heed its message, and penalize those that do not. “socially responsible” (up 63 percent). COMMENTARY: Brand marketer's should take note of the brand attributes Americans found important and those attributes that are less important post-Great Recession. Social networks like Facebook and Twitter have quickly become popular with consumers, and there has been a race by brands to have a social network presence and social marketing strategy in place, albeit still rather slowly as I have pointed out in previous blog posts. Technology has played a key role in changing consumer attitudes. The Internet has quickly replaced traditional media channels like print, radio and television. Some consumer's sopend more time online than they do reading books, newspaper and magazines or watching television. Brand marketer's are ever so slowly shifting their ad spending from traditional to online (social networks, SEO, online video, social games, blogs, etc.). Faster broadband speeds have accelerated Internet penetration. Everything seems to have gone digital (HDTV, music, video, music and images). There has been an explosion in digital mobile communications and entertainment devices (mobile phones, tablet computers, netbooks, laptops, portable music and video players). The majority of connected consumers use the Internet for their news, entertainment and information, particularly products and promotional offers. America is undergoing generational changes as our population is becoming olders. Baby Boomers are retiring, living on social security and buying less of what they did when they were young. They now spend more on health care products, medical care, print media (books, magazines and newspapers) and nostalgic products. Teens, Generation Y and Generation X have driven much of the growth in Internet penetration and adoption of digital mobile devices. The younger generation is more interested in social causes and environmental issues, family values and consider social networks instruments for change and a platform for spreading word-of-mouth virally, through videos and sites like Facebook and Twitter. Generation Y and X both value self-sustainability, mistrust government and big corporations, and unlike their parents and grand parents, believe that social security is a thing of the past. Generation X want less hype and more facts. Both Gen X and Y are skeptical and often mistrust advertisements. 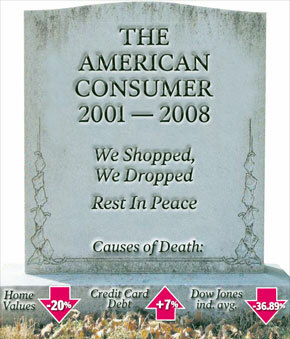 Consumer frugality is the all encompassing word that best describes today's consumer. They are more price-to-value oriented, and always looking for a good deal. They want both good quality at a good price. Consumer frugality is the driving force behind mass retail discount chains, dollar stores, DIY stores like Home Depot and Office Depot, discount coupons (both printed and digital) and social group buying sites like Groupon. American's have also become a "credit card" society. Today's consumer carry too much debt (nearly $10,000 on average), and as a result of the Great Recession and unemployment, have either curtailed purchasing expensive products, declared bankruptcy or negotiated adjustments in both their mortgage credit cards balances and payments. While respected analysts question the soundness of deal-based social buying, Google has reportedly offered a staggering $5.3 billion for industry leader Groupon. The deal -- which sources tell BoomTown could go down as early as Wednesday -- "will move the search giant instantly to the top spot in local commerce online and give it huge troves of data about consumer buying habits and merchant information across the globe." As such, "It is a killer move for Google--despite the high price-given it has long tried to enter the local advertising space, with decidedly mixed results." "Industry observers say Groupon's ability to straddle the worlds of online retail and brick-and-mortar commerce makes it attractive to a range of companies" -- and Google in particular -- notes the Chicago Tribune. "If Google buys Groupon for $5.3 billion ... it would go down as one of the most spectacular venture investments since, well, probably Google," writes The Wall Street Journal. No doubt, combined with its pending acquisition of travel data leader ITA Software, a Groupon grab will send government regulators and antitrust lawyers into a tizzy. Antitrust concerns aside, Search Engine Land's Greg Sterling says Google would be crazy -- with a "capital C" - to drop $5 billion on Groupon. "Google is sitting on more than $30 billion in cash so maybe $5 billion isn't so much in that context," writes Sterling. Yet, despite a strong revenue stream and immediate control of the local deal space, he suggests: "Just as we now see 'check-in fatigue' with Foursquare et al, there is what I will call 'deal fatigue' emerging." On the contrary, "It would be worth every overpriced penny," insists Mashable. "Groupon has an asset that Google covets so highly that it's willing to pay billions: local advertisers." As TechCrunch reasons, what seems clear is that "buying Groupon would be a very risky $5 billion bet for Google in an unproven area outside its sweet spot of search." COMMENTARY: I think that Groupon's success is more evidence that the Great Recession has created legions of frugal consumers looking for a deal. You see this not only online (I just got email offers from Borders, Amazon, Verizon and Toshiba today) but in red tag sales at retail merchants stores everywhere. It is Black Friday and Cypher Monday every day now. Whether consumer's will eventually get tired and get deal fatigue remains to be seen. I joined Groupon and now get a daily deal in my email box like clockwork, but most of those offers are worthless to me. Deal relevancy is a big problem with Groupon. Their revenue model appears to be simply to send its members as many offers as possible, with the hope that enough consumers will take the bait and participate in the group buying promotional offer. They really don't appear to be too concerned with what kind of offers their members want. I do eat out frequently, but I hate shopping, so it may be that they don't have sufficient information about my purchasing behaviors to target me with relevant offers. Getting back to Google's acquisition of Groupon. This is just another case of Google's desperation to get into social networking at any cost. It's much cheaper (supposedly) to acquire a social group buying company like Groupon, than build one from the ground up. They tried the social networking bit on their own with Buzz, and it failed miserably, and Google Me, their top secret social network has been delayed until April 2011. If the rumors are true that Groupon has several suiters, this is only going to drive up Groupon's sales price, and at the reported $5 billion price tag Google is willing to pay, then Groupon has succeeded in driving up the price from the original $2 to $3 billion range. I will say this for Google though, Groupon is a great fit with Google Places, which offers Google users promotional deals from local merchants. Groupon is also making a killing on their cut of each group buying promotional deal. Groupon has also pissed off 40% of its merchants, who claim they have lost money on the promotional deals they ran through Groupon. This brings into question, whether the Groupon revenue model is sustainable, since it may not lead to future incremental sales and attrition levels are too high to maintain a large loyal following. God, I hope Google knows what they are doing. Many social media marketers are working with theultimate goal of integrating social into their company’s overall marketing efforts and gaining the experience to conduct the best social campaigns. But according to research from SmartBrief conducted by Summus, they could have a long wait. The June 2010 survey found that, while a few companies at each stage of experience with social media marketing did have a fully integrated strategy, it wasn’t until companies had been working in social media for at least two years that even a quarter of respondents had fully integrated their programs into their business model. And integration was more common than more basic coordination only among companies that had used social media for at least three years. Most companies using social media, however, have nowhere near that level of experience, according to the survey. Just 5.4% have been doing social media marketing for more than three years, and another 7.5% have been doing it for two to three years. Nearly half of companies (47.6%) have less than a year of experience, meaning it’s much more common for social media marketers not to be integrated or coordinated as part of the larger marketing picture. In its report, SmartBrief noted that its sample was self-selected and likely to be more familiar than average with social media, more interested and engaged with the channel, and also more proficient. This suggests that among the larger population of companies, integration efforts could be even further from complete. COMMENTARY: One of the biggest unknowns is whether social networks like Facebook, Twitter and Foursquare are effective in creating true engagement between a brand and its fans or even generate incremental revenue streams. I sometimes feel that individuals do not become Facebook members to engage with a brand, but join in order to connect with like-minded individuals with similar interests, and that the resulting social interactions between these individuals lead them into making buying decisions based on word-of-mouth rather than what the brand says in an advertisement. Researchers at MIT recently developed a study that suggests that social factors can get you to try something through a promotional offer such as a discount coupon or award, but not necessarily buy that product again. If MIT's findings are true, then it casts a giant shadow of doubt over the whole idea of social media as an effective channel for generating incremental revenues. After all, isn't the key reason for advertising to generate sustainable revenue streams and brand loyalists, not just create brand awareness. Groupon's highly successful social group buying site suggests that MIT's study (see above) could be accurate concerning the effectiveness of promotional offers, to create one-time revenues, but this may not necessarily result in incremental revenues, a fact that has led many social media experts to suggest that Groupon's business model may not be sustainable and not cost-effective for its merchants. The above studies make you wonder if social media is doomed to be nothing more than a platform for generating sales through promotional offers, and the concept of developing deeper engagement between a brand and its fans is total B.S. Facebook apparently realized this very fact by adding Facebook Deals to its services. They are leveraging their 500 million plus membership. Website training and software company Intellimon, in partnership with the University of Bradford, developed a report revealing that 67 percent of respondents to their recent survey use the social media platform Facebook to promote their businesses, but only 29 percent find the site effective for driving traffic to their website. It's also telling that a recent report proves what common sense tells us about social networks: The motivation to "like" a brand on Facebook is most often driven by monetary gain, with 40 percent saying they become fans to receive discounts and promotions. Yet only a small percentage of consumers (17 percent) say they're more likely to buy a brand after becoming a "fan" on Facebook, according to the same survey. In another interesting revelation, the PEW Internet and American Life Project reported that only 4% of Americans are using location-based check-in services like Foursquare and Facebook Places. In another of my blog posts I also provided 11 reasons why location-based check-in services are not being used. The above studies and findings can definitely raise some doubts among brand marketer's, and the numbers show that although 75% of businesses have a social media presence, they are still very skeptical and spending very little on social media (see below) when compared to traditional media channels. Twitter just started monetizing their social network blogging site with Promoted Tweets, and it is really having problems convincing advertisers that their social network is an effective advertising platform. The fact remains that Facebook and Twitter, the two largest social networks, only began monetizing their sites in 2009 (Facebook) and 2010 (Twitter). Both are still developing and refining their revenue models and gathering and analyzing data about consumer behaviors. The current state of social media has created more doubts among brand marketers resulting in skepticism and resistance. I have often stated that the advertising supported business model of social networks is busted and that social networks like Facebook and Twitter will never become profitable with advertising alone. This has generated a flurry of social services including social games, mobile apps and location-based check-in services. Controversial firm BlackLight Power says it will show off how it can generate power with water and the equivalent of pocket change next year. The company claims -- amid harsh criticism that its assertions are the kookiest thing to come along since cold fusion -- to have discovered a way to produce energy from converting a hydrogen atom into a hydrino, a purported low-energy form of hydrogen that researchers at the company claimed to have discovered. When ordinary hydrogen is mixed with a chemical catalyst at a relatively cool 50 degrees Celsius, hydrogen molecules turn into hydrinos, according to Blacklight. The hydrogen-to-hydrino reaction releases 200 times more energy than the amount of energy that gets released when hydrogen is burned. BlackLight has largely concentrated on harvesting heat from the reaction. In a recent experiment, BlackLight says researchers have generated electricity directly from the reaction. According to BlackLight's calculations, a liter of water a second could generate up to a gigawatt of power. The capital cost of a power plant built on the technology would come to $25 a kilowatt. By contrast, nuclear plants cost $6,000 or more a kilowatt, while a natural gas plant runs $850 a kilowatt. The company now hopes to develop fuel cell-like devices to generate distributed power. "It works phenomenally better than the heat system," said CEO Randell Mills. "This is going to be big time. This has tremendous characteristics." Skeptics abound. Quantum mechanics rules out the existence of hydrinos, according to, among others, Andreas Rathke of the European Space Agency. Researchers at Rowan University have examined BlackLight's technology and co-authored papers with the company, but other scientists have not been invited inside to examine the process. So when do we get to see it? A public demonstration will come in 2011, Mills said. COMMENTARY: I can remember when we thought the world was flat and that Earth was the center of the universe. They also said that the speed of sound could not be broken and that the atom could never be split. Blacklight Power still needs to convince a very skeptical scientific community that refutes even the existence of hydrino's, or that Blacklight Power's their proprietary electrochemical reactants or solid fuels can indeed produce hydrogen energy from water, a process they call hydrogen-to-hydrino power. Researchers at Rowan University have examined BlackLight's technology and co-authored papers with the company, but other scientists have not been invited inside to examine the process. Blacklight Power is jumping way ahead of itself making promises to produce very cheap and clean electrical energy from free-standing CIHT (Catalyst Induced Hydrino Transition) fuel cell power generators, yet Blacklight Power scientists are still unable to explain the spike in energy produced during experiments using water to produce hydrogen-to-hydrino energy utilizing their proprietary electrochemical reactants or solid fuels, which they refer to as the Blacklight Process. Bloom Energy remained in stealth mode for nearly ten years and spent $400 million to produce clean electrical energy from their patented solid oxide fuel cell technology. Many fuel cell experts were skeptical that Bloom would ever succeed. Bloom delivered on their promise to produce clean electrical energy from fuel cells, and we finally saw their Energy Servers producing electricity for company's like Google, Wal-Mart and Federal express, and the individual fuel cell plates that produce that electricity. I can hardly wait until 2011 to see a live demonstration of Blacklight Power's hydrogen-to-hydrino power generator fuel cells in action. It’s common for small businesses to slip into bad habits that limit their ability to get funding. From unscreened customers to generous payment terms, here are some of the most common reasons lenders will not loan to small business owners. When you hear these pleasant words from your accountant, “You should take a draw before the end of the year,” think again. Building equity in your business has a positive impact on your ability to get funding. A lender always looks at your debt-to-equity ratio. The more equity you have, the better your ratio. If you believe you will be able to grow the business next year, and will need financing to make it happen, manage your debt-to-equity ratio as carefully as you manage your personal taxes. Good habit: Keep your business solid by re-investing to support growth. Many small businesses leave the setting of critical business practices to their customers. If you do not set clear payment terms and establish a pattern of following up to collect, your customers will assume they can pay you when it best suits their business. Following a policy of credit checks on customers and a consistent collections process can make running the cash side of your business much easier. If you are seeking working capital funding, your receivables will likely serve as collateral. Being a good steward of your collateral means a history of dependable receivables with few disputes. Good habit: Establish fair terms with your customers and follow up - consistently. You might believe that you know every aspect of your business and creating a formal Income Statement and Balance Sheet every month is not necessary. However, if you intend to get a working capital loan, accurate and timely financial statements are vital. Additionally, taken together, the revenues, expenses and balance sheet need to make sense. If you are not confident that you know how to read and interpret financial statements, seek the help of an accountant or business consultant. Your financial statements are like a first impression to a lender. Good habit: Be disciplined about preparing accurate and timely financial statements each month. It’s not uncommon for small business owners to take a cowboy mind-set to running the business. You may see yourself as the Good Guy whose word is as good as a contract and who can keep important decisions and plans in your head. While we hope that is true, lenders and other businesses judge you by your business practices. Guard your reputation as a professional, organized business person by putting your relationships in writing. For example, quotes should always be in writing. When dealing with vendors, negotiate a payment schedule, put the agreed terms in writing and then pay on time. If you are going to pay late, check in with your vendor and let them know ahead of time. Your credit score will thank you. Be diligent about clearly recording in writing loans to and from owners and other related parties. Sticking to the practice of putting your agreements in writing creates the impression that yours is a well run business and helps the lender make a fast and favorable decision. Finally, have a written business plan. A business plan, even a brief one, demonstrates to the lender that you have a plan to repay the loan. Good habit: Be disciplined about keeping a record of all agreements and transactions in writing. Often we see business owners who are reluctant to sign a personal guarantee or pledge collateral when seeking funding. It’s natural that a business owner would want to protect himself and his family. But a lender is different from an investor. An investor puts up capital, knowing there is a risk that they will not get their money back. In return for that risk, the owner guarantees them a share of the business’s success. A lender, on the other hand, does not expect a share of the business. They expect to be repaid. By signing a personal guarantee and pledging collateral, the owner assures the lender that the loan will be repaid. Good habit: Be realistic about the underlying risks and expectations when seeking capital. COMMENTARY: I agree with all of Dan Dreschel's comments, but would like to add a few comments of my own. I have lost my patience with clients that run their businesses out of a shoe box, which is why I am so careful taking on clients who need venture capital or bank financing. I ask all the hard questions, and many prospective clients don't like it, but it is best to seek out the answers, and try to fix the problems before they go looking for financing. Unfortunately, far too many small business owners either procrastinate, too busy running their business to keep their house in order, or run it recklessly. Generally, they have no financials (sometimes for several years), maintain no inventory, accounts receivables, accounts payables or cash balance or other financial records, then they expect banks to greet them with open arms, just because business is good. On the other side of the coin, banks simply are not lending, they have become so risk evasive, that they loan to only the most credit-worthy customers, then require collateral and personal loan guarantees from the principals. This article makes it sound like a small business owners have no alternative but to provide a personal guarantee in order to obtain the loan. I beg to differ, and would rather walkaway from that bank, and go to another. If you have sufficient collateral, managing your business properly and profitability, and you agree to pay a high rate of interest, and business is good, that should be more than sufficient. Banks are their own worst enemies, they are primarily responsible for the financial meltdown, so they are at the top of my list as most untrustworthy businesses. They drove their banks to the brink of bankruptcy, then after the feds bailed their asses, they pay their executives huge bonuses, while denying small and large businesses the financing when they need it the most. If you're a fan of John LeCarre or Jason Bourne, you'll want to dig into these three infographics. 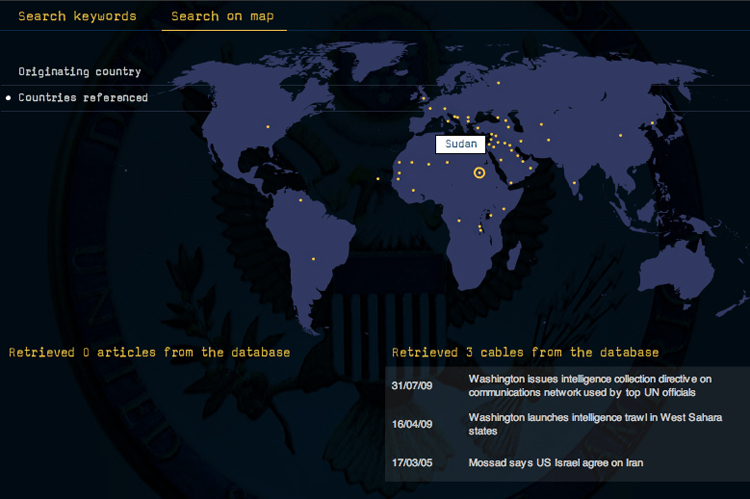 Yesterday, WikiLeaks detonated the usual veil of secrecy that shrouds diplomatic negotiations, by releasing 250,000 cables that detail everything from Saudi Arabia urging the U.S. to attack Iran, to U.S. diplomats being ordered to spy on Hamas. Here, we have the three best online infographics for digging into the details. There have been a series of superb articles detailing the most serious revelations coming out of the cables (none are top secret, though many are secret or "noforn"--that is, not intended for the eyes of foreign governments). But just like with previous WikiLeaks disclosures, what's so fascinating about the cables is that we can finally see the sausage making that goes into high-stakes diplomacy. If you've ever been a fan of John Le Carre or Jason Bourne, you'll want to read the original cables. But really, the best online feature comes from -- you guessed it --The New York Times. This time, they actually eschewed an infographic in favor of a simple online feature, which allows you to click on the sexiest or highest stakes cables. We particularly recommend this one, which details a wedding among Russian separatists and reads almost like a short story. The writer, among other things, tells of a drunken clan leader dancing with gold-plated handgun in his waistband, and the leg room in a Rolls Royce being pinched by the AK-47 on the floorboard. And here we thought that being an Embassy flack just meant getting drunk with spies. COMMENTARY: Having served in the foreign diplomatic service in both Israel and The Philippines for four years during the Jimmy Carter and Ronald Reagan administrations, I was exposed to matters of utmost confidentiality and secrecy. You will be surprised what goes on inside our Embassy's, particularly the U.S. Embassy in Israel. In many departments American embassy staffers are segregated from our foreign nationals who work primarily a number of support roles from maintenance to file clerks. 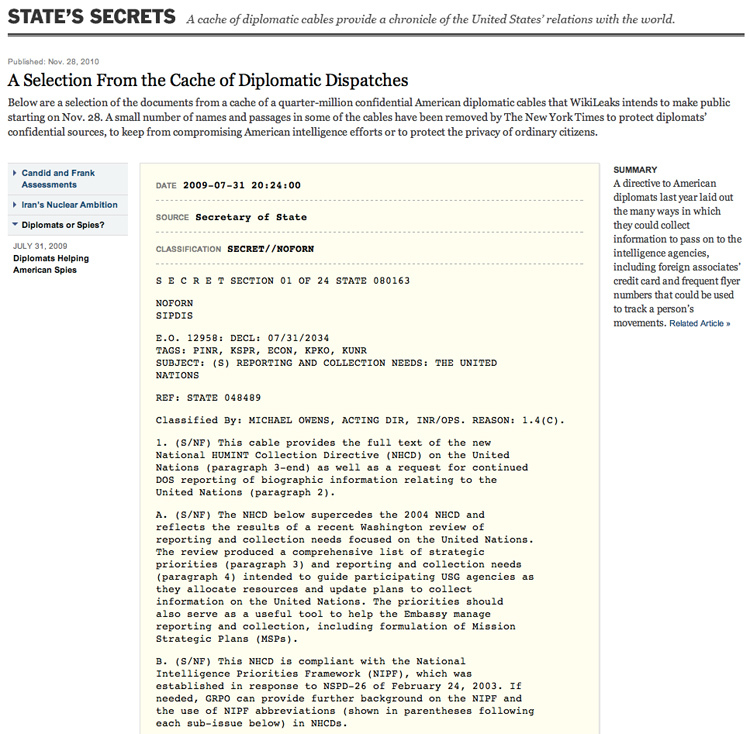 CIA sections are never referred as such, and off limits to everyone, including the Ambassadors, since many subjects are on a need to know basis. A sort of Don't Ask, Don't Tell. I read several excerpts from the compromised documents from articles appearing in both the New York Times and UK Guardian, and believe me, the information about the activities and personal feelings of our senior diplomats and not so senior Embassy staffer's is nothing compared to the juicy and scary stuff I heard and saw with my very eyes. American relations with the Israeli's have always been icy to say the least. There is not a feeling of deep trust between the U.S. and Israel. Everything you see on TV is in the spirit of unity and good public relations. These feelings are mutual. The attack of the USS Pueblo in 1967, is a good example of what I am talking about. If you have been following the news you are very aware that Israeli agents constantly spy on US facilities, several of them have been captured, and deported back to Israel. It's like a game. We slap them on the hand, they reciprocate when they catch one of our spies. I am politically agnostic, having given up on both the Republic and Democratic parties a long time ago. You cannot trust either party, and Barack Obama has really disappointed me. He should never had tried to kiss up to the Republicans in the spirit of bipartisanship. I can't believe he was so naive as to believe that working closely with the Republicans was going to work. Obama is a stooge for the CIA and NSA, who work not only clandestinely, but report to know body, not even the Director, who is mostly a figurehead. If Americans only knew. I hope that more documents are released for public consumption, I just cannot wait. The rapid revisions suggest that the PC market, while still growing, is in flux as it deals with the growth in demand for tablets. Just last month, Gartner reported that 3rd Quarter PC sales﻿ grew by just 7.6 percent in what is normally a strong period. Gartner said over the long term, media tablets are expected to displace around 10 percent of PC units by 2014. The research firm said PC manufacturers, who have relied in the past on pricing declines and pushing volume, will need to add more services and technology innovation to stay competitive. Meanwhile, Citigroup on Monday forecasted that 35 million tablet computers will be sold in 2011, while FBR Capital Markets said it expects 70 million tablets to be sold next year, with 40 million of that figure coming from Apple. FBR estimates that every 2.5 tablets sold negates the sale of 1 PC. Emerging markets will drive growth while mature markets will face mounting challenges. Emerging markets will account for more than 50 percent of total PC shipments by the end of 2011 with many of those consumers potentially leap frogging directly to alternative devices. Consumers are postponing purchases in the face of economic uncertainty. That’s led to a steep downgrade in shipments in mature markets. Emerging devices like tablets are growing more PC-like, making it easier for consumers to choose them over PCs, especially mini-notebooks. They’re especially popular with people who want more dedicated entertainment and instant-on features. The life cycle of PCs are being lengthened as consumers supplement their computing needs with emerging devices. The growth of virtual desktops, while not expected to be a major factor until 2012, will also lesson the need for new PC units as consumers run them on refurbished PCs and thin client machines. PCs aren’t going to go away any time soon, but they are increasingly challenged. While they have a clear upper hand in content creation and more intensive computing, tablets are showing that they serve a need and can lessen the computing workload of a traditional PC. With Android tablets expected to jump into gear next year, the challenge is for PC makers to find ways to keep their traditional computers attractive. Apple has done it with the Macbook Air. Now, it’s up to others to push the edge or risk losing even more units sales to tablets. The above chart does not include the Samsung Galaxy Tab, Barnes & Noble's ColorBook. RIM BlackBerry, Acer, Microsoft, Motorola, Fujitsu, Sony, Archos, Lenovo, Google and ViewSonic have announced plans to introduce their own tablet computers either in time for Christmas or early 2011. You can bet that there will be no shortage of tablet PC's in the coming months. COMMENTARY: If you want to just surf the Net, listen to music, read digitized books and magazines and watch movies, the iPad is your cup of tea, but for real productivity in the corporate world and enterprise environment, you will need a desktop or laptop with a keyboard and large screen. Maybe, it's just my built-in bias concerning tablets, but I find them cumbersome to use and limited in what they can do. There, I mouthed off, now shoot me. The Russian government has big visions of creating a technology capital that rivals Silicon Valley. But it will need some investors who think small to make that happen. That’s where Runa Capital comes in. The venture firm has seeded the first of what it says will be more than two dozen investments in its quest to commercialize innovation across the country. “I have warm words for my investors,” said Andrey Vasilevsky, the serial entrepreneur who scored Runa’s first $2 million investment for his newest venture, OnAir3G. The 10-person Moscow company will provide a service for smartphone users that will use VoIP, global positioning and some elements of social networking. OnAir3G will use the money to hire another 20 employees and launch during the second quarter of 2011. The funding is significant for OnAir3G, as well as for Runa - this is the first of several funds the firm hopes to raise - and for the crusade launched by Russian President Dimitry Medvedev earlier this year to establish technology as an economic engine for the country. Medvedev hopes to replicate Silicon Valley in Skolkovo, a suburb of Moscow, and is crafting plans now to combine that potent cocktail of innovation, business expertise and funding that has created so many tech titans in the U.S. Runa partner Alexander Galitsky is also on the Skolkovo advisory board and has discussed Runa opening and operating a tech incubator in Skolkovo, according to Runa Managing Partner Dmitry Chikhachev. The effort by Medvedev is seen as a shift away from Russia’s oil and gas economy, which has taken a hit in recent years, and back toward the country’s traditional strengths of science, technology and mathematics. That’s why Runa Capital, at least for now, is more like a band of super angels than a traditional VC firm. Chikhachev, a serial entrepreneur and business executive who carries Masters degrees from both the Moscow Institute of Physics & Technology and the American Institute of Business and Economics, began working to form Runa in October 2009. He connected with a handful of serial entrepreneurs and technology veterans, raising most of the fund’s initial $10 million. Just as importantly, he convinced top Russian talent including Serguei Beloussov, who has founded 10 start-ups including Rolsen Electronics Inc., Parallels Inc. and Acronis Inc., and Alexander “Sasha” Galitsky, an investor, serial entrepreneur and former head of digital communications for several Soviet space programs, to lend their expertise to entrepreneurs along with their cash. Chikhachev said he has another $10 million in soft commitments to Runa’s first fund from other investors and expects to raise an additional $30 million before closing. He aims to invest $1 million to $2 million in roughly 25, early-stage, pre-revenue tech companies between now and the end of 2012. “Hopefully, this will go well. We want to demonstrate a 10x return, build a good team and have a good track record,” said Chikhachev, adding he will explore raising another fund in three to four years. Although Runa will focus exclusively on Russian technology - the company tagline is “Globalizing Russian Innovation Potential” the companies it backs can be based anywhere. It has seven companies in its pipeline that it is looking at now, four of which Chikhachev said have a 90% chance of being funded. COMMENTARY: Runa Capital is small-time bananas when compared to Blue Sky Technologies, the Russian VC firm that has planked $200 million into Facebook, and thinking of planking down even more. I have no way of gauging who well Runa will do in the future, $10 million is not a large enough war chest. They just invested $2 million into OnAir3G, so this leaves $ 8 million. Kuna's founder does offer that they might raise another $30 million in "soft" investment for their fund. Russian startups have far too long turned to the West for funding, but their crooked system of government, including kickbacks and bribery, the Russian mafia, not withstanding, has made it difficult for U.S. VC firms to have sufficient confidence to make investments over there. The risk is just too high. I was surprised that the U.S. Department of State actually sent a delegation of American investors to Russia, joined by California's Governator to evaluate investment opportunities. From what I read, this was one huge waste of time due to political in fighting between two Russian organizations to lead the investment mission. TESLA MOTORS STOCK PRICE GREW BY 41% SINCE THE IPO IN JUNE, ANALYSTS SAY IT IS WAY OVER-VALUED, CAUSE FOR CONCERN? Doug Cheeseman of Saratoga tapped into his retirement savings to buy 700 shares of Tesla Motors early on, when it was $17 a share. On Friday, Tesla's stock closed at $35.32, just shy of Wednesday's all-time high close of $35.47. "I wish I had more shares," said Cheeseman, a biologist who travels the world leading wildlife safaris and who drives a blue Tesla Roadster when he is home. "At the time I bought the 700 shares I thought 'This is risky.' Now I think that in two to three years it will be near $100 a share." Cheeseman is not the only one bullish about the Palo Alto-based electric-car company that began publicly trading shares June 29. Although Tesla has yet to turn a profit, several recent announcements have boosted investor confidence. Tesla is working at breakneck speed to meet internal deadlines for the Model S luxury sedan, production of which is to begin in mid-2012. But much of the company's intellectual property and competitive firepower lies with its battery and powertrain technology, which partly explains why Panasonic, the world's leading maker of lithium-ion batteries, bought a $30 million stake in Tesla earlier this month. Another company that has partnered with Tesla is Toyota. At the 2010 Los Angeles Auto Show, which runs through Sunday﻿, Toyota showed off the electric version of the new RAV4, which will be "powered by Tesla" and released in 2012. The basic vehicle will be built at Toyota's plant in Ontario, Canada, but Tesla will build and supply the battery and other related parts at its Palo Alto headquarters. Toyota has yet to announce where the final assembly will be, but many -- including Tesla CEO Elon Musk -- are rooting for it to take place at Tesla's Fremont factory, housed in the former NUMMI plant. But despite those promising developments, some analysts think Tesla's stock, which trades on Nasdaq under the symbol TSLA, is overvalued. "I think the market is overreacting to the news about the RAV4 collaboration, which probably won't do much to increase Tesla's short-term profitability," said John Gartner, a senior analyst with Pike Research's clean transportation practice. "I wouldn't be surprised if the stock recedes a bit over time as investors realize that profits are still far off in the future." Others are banking on the fact that the Model S appears to be on track. Himanshu Patel and Vivek Aalok, analysts with J.P. Morgan, published a 38-page report this summer that predicted Tesla's revenue would rise from $100 million in 2010 to $1.8 billion by 2013. The report said Tesla's small size and roots in Silicon Valley, along with its focus on all-electric vehicles, give it an advantage over other automakers. Consumer interest in the Model S, which will list for about $56,000 but qualify for a $7,500 federal tax credit, appears to be high. More than 3,000 people have paid $5,000 to reserve the Model S to date, and foot traffic at Tesla showrooms -- including a recently opened store in Tokyo, the first in Asia -- is high. Today, a red Model S prototype will be on display at Tesla's Menlo Park showroom. Cheeseman, who has reserved a Model S, is planning to head up to Menlo Park to check it out. And he's not planning to unload his stock anytime soon. "I still have the 700 shares and do not plan to sell," Cheeseman said. "My son bought 100 shares at $19 and sold at $25 -- I told him he was crazy to do so." Battery Miles Per Charge - Typical lithium ion batteries deliver between 80 to 100 miles per charge, so electric cars are going to be restricted to owners living in large cities who drive to the grocery store or shopping mall. Tesla claims that its Li batteries can deliver 245 miles and 300 miles per charge for the Roadster and Model S sedan respectively. However, these numbers are for highway driving conditions, and mileage will drop dramatically for vehicles driven within inner cities, where vehicles make frequent stops. Unless there is a major breakthrough in electric battery technology, electric cars are impractical for highway distance driving. You would have to stop at least four times to get from San Francisco to L.A. The Tesla Model S might do it on one charge, but this leaves very little room for mistakes. Lack of EV Charging Stations - There is currently no widely dispersed network of electric charging stations. As expected, the majority of electric charging stations are located in the large cities. A huge investment in EV battery charging infrastructure will be needed before consumers feel comfortable owning an EV. Battery Life Span - Tesla claims its Li batteries can last 7 years or 100,000 miles before they need to be replaced. According to Tesla, after only five years of use, their Li battery packs for their Roadster will only retain 70% of their charging capacity, and it drops from there. This means owners will have to charge their batteries more often, adding to the drop off in charging capacity and a drop in mileage between charges. Battery Charging Times - According to Tesla, it takes 3.5 hours to fully charge their Li batteries. You will have to plan ahead and take into account these charging times, particularly for long distance driving. Battery Replacement Costs - In 2009, Tesla claimed that it would cost $36,000 to replace their Li battery pack. However, the replacement cost can be greatly reduced if you opt to pay $12,000 up front at the time you purchase your vehicle. The reasoning for the lower price, as opposed to waiting ten years to replace the Li batteries, is calculated on the present value of the $36,000 and anticipated improvements in EV battery technology that will reduce their cost. The battery replacement-to-vehicle acquisition cost ratio for the Model S sedan, at current prices, is roughly 0.60 to 1 if you opt to replace the batteries after seven years, but drops to 0.24 to 1 if you opt to pay up front for a new replacement battery pack. This is outrageous. Battery replacement costs will have to come down dramatically. 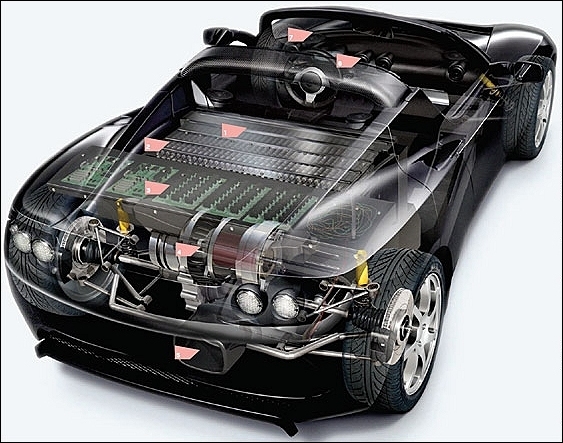 Unusual Battery Pack Technology - Tesla Motors refers to the Roadster's battery pack as the Energy Storage System or ESS. The ESS contains 6,831 lithium ion cells arranged into 11 "sheets" connected in series; each sheet contains 9 "bricks" connected in series; each "brick" contains 69 cells connected in parallel (11S 9S 69P). The cells are 18 mm (0.71 in) in diameter and 65 mm (2.6 in) long (18650 form-factor); this type of lithium-ion cell is also found in most laptop computer batteries. The pack is designed to prevent catastrophic cell failures from propagating to adjacent cells, even when the cooling system is off. Coolant is pumped continuously through the ESS both when the car is running and when the car is turned off if the pack retains more than a 90% charge. The coolant pump draws 146 watts. It is difficult for me to envision that their stock price is due to Tesla's Li battery technology alone. Price of Gas - Gas prices will have to increase to at least $5.00 per gallon to create real traction in EV car sales. A small producer like Tesla Motors is not going to have much of a chance against the larger automakers because of their small size and limited resources, namely capital and production capacity. I am very impressed with the performance of the Roadster on the street and on the race track (See my previous posts). The Roadster can go 0-60 mph in 3.7 to 3.9 seconds depending on the model and has a top speed of 125 miles per hour. That beats a lot of street muscle cars and exotic sports cars on short distances, but I don't expect owners to drive their Roadster at those breakneck speeds without dramatically affecting battery performance and life spans. In a previous blog post, I calculated that Tesla would have to produce about 15,000 Roadsters per year just to break-even, so given current sales volumes, investors can expect the company to generate significant operating losses for at least the next three years. The Model S sedan does not go into production for at least another two years, and the Chevy Volt and Nissan Leaf will both capture significant market share and generate first mover advantages in the sedan segment, long before Tesla gets their Model S sedan into the marketplace. Tesla reported revenues of $31.9 million and a net loss of $34.9 million in the quarter ending September 30, 2010 (post-IPO). Through September 30, 2010, Tesla has lost $103 million on gross revenues of $50 million, and accumulated losses of $300 million since inception. Tesla Motors stock ended at $23.89 when it went public at the end of June 2010, but the stock price is currently (11/29/10) at $33.73--an increase of 41%. Not bad for a company with so much red ink. Even with the Toyota deal to provide Li battery packs for their electric RAV4, many analysts believe that Tesla stock is over-valued, and I am certainly one of them. I scoff when I read that Tesla has projected revenues of $100 million for 2010 and $1.8 billion by 2013. Where are these numbers coming from? If I were a Tesla Motors stockholder, I would be very concerned if those projections can be attained. Another bad quarter, and Tesla Motors stock could tumble dramatically to more realistic price levels. I know one very experienced senior broker, and he has told me that they are "hedged" on the down side or sold their Tesla holdings. It should be obvious that there has been too much hype and a whole lot of speculation in Tesla stock. One hell of a way to make a living. EBAN is the independent and non-profit European Trade Association for angel investors, seed funds, and other Early Stage Market Players. EBAN was established under the auspices of the European Commission in 1999 by a group of early business angel networks in Europe and EURADA (the European Association of Development Agencies). EBAN is the representative in Brussels through direct and indirect membership of more than 250 business angel networks in Europe. These in turn federate some 20.000 angels, and receive about 40.000 business plans a year. EBAN brings together over 100 member organisations in 28 countries today. Build new relationships, new business opportunities by networking with peers across border. Get answers to day-to-day challenges: don’t reinvent the wheel, we might have the solution! Its charter is to represent the early stage investment market in Europe; carry out research on the angel market and produce facts and trends; identify and share best practices in the early stage funding industry; promote the role and visibility of business angel networks and early stage funds in Europe; promote synergies and networking opportunities among various players in the industry; support the emergence of professional structures and quality standards across Europe; and support the internationalization of the angel and early stage industry and movement. EBAN's members including individual business angel networks from European countries, regional and national federations of business angels networks, business angel networks with international focuses, early stage venture capital funds. Together with its North American counterpart, ACA, it was a founding member of WBAA, the World Business Angels Association. Each year EBAN holds a pan-European Congress in a different European city. The 2010 Congress will be held in Istanbul, Turkey. 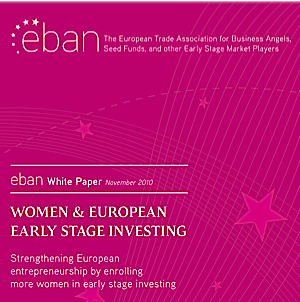 In November 2010, EBAN completed a white paper titled, "Women and Early Stage Investment", with the goal of fostering the creation of more women angel investors. The white paper can be downloaded HERE. COMMENTARY: If you are a European startup entrepreneur and are trying to connect with prospective angel investor's, EBAN is well worth looking into.